Yet, it’s tough to put a label on Gorman – he’s a teacher, speaker, consultant, facilitator, advisor, advocate and blogger. He has won numerous awards including Southwest Allen County Schools Teacher of The Year, State of Indiana Semi-finalist Teacher of the Year, US Air Force Association Indiana STEM Educator of the Year, and Fort Wayne Education Innovator of the Year. His award-winning blog (which has been known to have 1500 visits in a day), focuses on 21st century skills, STEM, project-based learning, educational reform, and technology integration. Student-centered learning with a view to our future is at the heart of what Gorman advocates for every day. of giving students “voice and choice,” and the critical role of empathy in the learning process. Enjoy today’s Daily Edventure. It has been an honor and a privilege to be recognized as a Teacher of the Year in my district, Indiana STEM Educator of the year (2010) by the US Air Force Association, an Advocate for Education by Johns Hopkins, and a leader in STEM education by the Siemens Foundation. I feel that it is a small but constant daily educational journey that truly leads to educational innovation. The relentless everyday effort and work we perform is the real achievement that brings about change and innovation. This becomes possible as we grow and learn each and every day. For me, one day it might be writing an inspirational blog posting, or providing an encouraging answer to an email. On another day, it could be participating in a positive conversation with a student, educator, business person or parent. It might involve helping a fellow educator come to a better understanding during a professional development session, or the comments that are posted half way around the world in an educational forum. As we serve each other day in and day out, I believe that the support, encouragement, and resources we give to each other allow for innovation and greater success of student learning. Through all of our learning and sharing, it is possible to see such innovative practices as student-centered learning, one-to-one computing, project- based learning (PBL), curricular integration and connections, and authentic experiential learning come to a full bloom. While it is hard to see the amazing gains we are making with these small incremental steps each day, it becomes very evident as we all reflect and look back over time. I would like to think that my work has resulted in dream fulfillment, opportunities, and possibilities for those students and teachers I have worked with and have served. I have been instrumental in bringing one-to-one technology to my district. I have helped in the growth of PBL across the state of Indiana and beyond. My blog has assisted educators around the world. Through in-service and presentations across the nation, I have assisted teachers in understanding and facilitating such practices as PBL, STEM, facilitation of 21st century skills, and technology integration. This has included facilitating STEM educators at the Siemens Discovery National STEM Institute in Washington D.C. the past three years. Along with speaking at state and national conferences, I also provided professional development opportunities for educators at the very first PBL World in Napa, California in June, 2012. This effort not only included highlighting the eight essential elements of PBL, but I also developed an in-service for PBL and technology integration. I felt very honored last summer when Johns Hopkins University presented me with an award for being a friend and supporter of the University in supporting their educational efforts. I think the biggest key to finding success is to believe in the dream, allow passion to be the motivator, and to see your vision through no matter what the obstacles. In the classroom I have used technology to amplify best practices such as PBL, student centered learning, 21st century skills acquisition, balanced literacy applications, and STEM education. Furthermore, I have used technology to stimulate learning while promoting student innovation, inquiry, and creativity. This may be as simple as giving students the skills to effectively search for and evaluate information found on the web, or providing problem solving activities in a STEM-based robotics mission. Most of all, allowing students to create with technology allows them to be more actively engaged and involved in their own learning. I think the biggest obstacle was the need to reflect on and then change my own thinking based on my own learning experiences. That allowed for a paradigm shift. This process has allowed me to redefine learning and has facilitated a belief that the student must be the major stakeholder in his/her education. It is only through promoting such attributes as voice and choice, a key element in PBL, that I have found the ability to coach a culture of real learning. It has been my direct experience in this process that has allowed me to hurdle the obstacle that was programmed into me through my own K-12 education. The United States, along with the rest of the world, is going through an exciting adventure of transforming the learning process. I believe there are infrastructures, made possible by both the public and private sectors, that bring educators together to collaborate through educational communities beyond their districts, states, and nations to bring about change. It is these communities that provide the momentum and passion to bring a new and exciting educational experience to our youth. I am especially proud that in my region of northeast Indiana there are public and private initiatives that are enthusiastically supporting such educational endeavors as PBL and STEM. I believe that a culture must be built that embraces the lifelong learning process. It must be recognized that a real education is an experience and a process, not the summative end that can only be measured by a limited test. We must find ways to address, promote, and assess communication, collaboration, critical thinking, and creativity. I really believe that technology is giving us some great possibilities in education. When I think of such great educational innovators as Dewey and Piaget, I can’t help but believe how excited they would be to see the realities and future possibilities that technology has brought to their dreams, work and ideas. While there have always been great educational experiences, I believe that technology integrated with best practice provides amazing opportunities. Not only can we now give students voice and choice, but we can do it beyond our classroom walls and throughout the world. I believe that sincerity, empathy, and passion are essential in making a difference. These elements, along with an understanding of best practice and servant leadership, will open the doors not just to student success, but also to mutual growth for all educators. Understand that the road will at times be difficult and remember these essential keys. Also, don’t forget to look for that sparkle in students’ eyes that indicates their engagement and excitement about learning. I think that as we walk the path to the Common Core (US standards currently being adopted) we will find that we will also be promoting a real and authentic learning experience. Programs such as PBL, through the promotion of 21st century skills, understanding and application of content, student voice, and authentic experiences and assessment will help students most ­­­­in their learning. Sadly, the path of standardized tests based on rote memorization has been in the way and will hopefully become an extinct obstacle to real learning in the very near future. I would give every child the tool of empathy. I believe it is empathy that allows for true reflection and metacognition. It is empathy that allows an individual to take a step back and see the bigger picture, opening the door for true collaboration, cooperation, and communication. 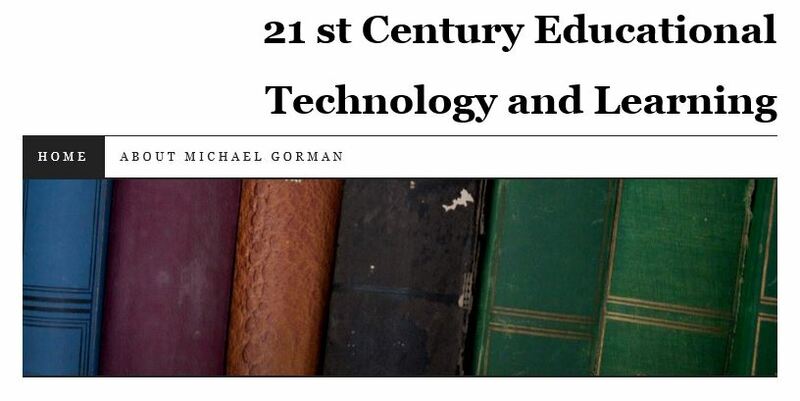 It might just be the key that opens the door to those 21st century skills we talk so much about. Empathy truly does allow the ability to create a society that works and learns together. Website I check every day: I enjoy reading Edutopia… though I probably check out weather.com and Google search each day. Person who inspires me most: I am fortunate to be surrounded by amazing people that are a constant source of inspiration. I have to recognize my wife, Jane Gorman, as that one person that provides support and inspiration day in and day out. She truly is a best friend that is always there for me. Favorite childhood memory: I grew up in the state of Michigan and always looked forward toward to traveling to the northern regions of the state. The lakes, forests, and wildlife were magical. Today, I still find it a wonderful place to disconnect and enjoy the wonders of the north woods with friends and family. Next travel destination (work or pleasure): In the heartland of Iowa to address STEM teachers. I am looking forward to meeting new people and also learning something from them. When was the last time you laughed? Why? Humor and laughter are a part of my everyday life. In fact I believe it is essential that we keep our sense of humor as we teach and learn. I think my last time of laughter was sitting on the back deck reflecting on the past week with my wife Jane. important to strive to find ways we can get “better” each and every day. This entry was posted in People, Social media and tagged 21st century skills, Buck Institute, Collaboration, communication, creativity, Critical thinking, Project-based learning, STEM education. Bookmark the permalink. Mike (and Jane), This is both genuine and impressive. Congratulations on the recognition an honors bestowed. We are fortunate to have you as our own. A heartfelt Congratulations goes out to you for your many achievements and continuous work to improve the education of our students! Thank you Mike for sharing your passion, knowledge and strength with all you come in contact with, most especially the SACS community. The work you and Jane do naturally is a credit to both of you. Best wishes for your continued efforts, may they be recognized by peers and educational leaders familiar with your quest as you work to improve the education process for all students.